I enjoy going high and light and most often take shorter "fast- packing" trips; my longest trips are about a week. I've lightened my pack load because I enjoy hiking more when toting less, I can go farther and on tougher terrain, and I have cranky ankles. 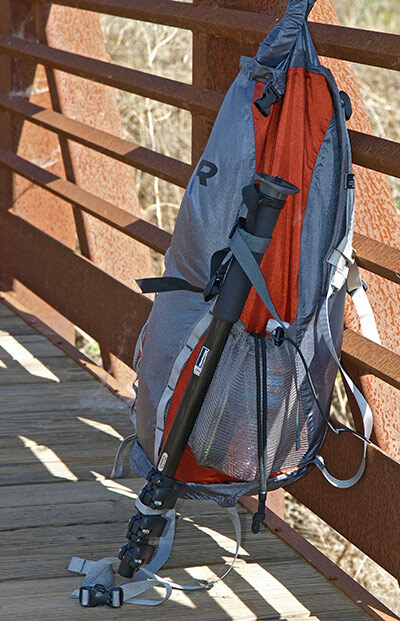 I use trekking poles and generally hike solo or tandem. I've backpacked all over the west and now primarily hike California's Sierra Nevada. My favorite trips are alpine and include off-trail travel and sleeping in high places. When winter arrives, I head back for snowshoe outings in the white stuff. Summit Sack, fully stuffed & ready to roll. The Outdoor Research (OR) DryComp Summit Sack is a single-compartment, roll-top, seam-sealed day pack that doubles as a waterproof compression stuffsack. Or is it a stuffsack that converts to a day pack? Which, I suppose, depends on the user's priorities. 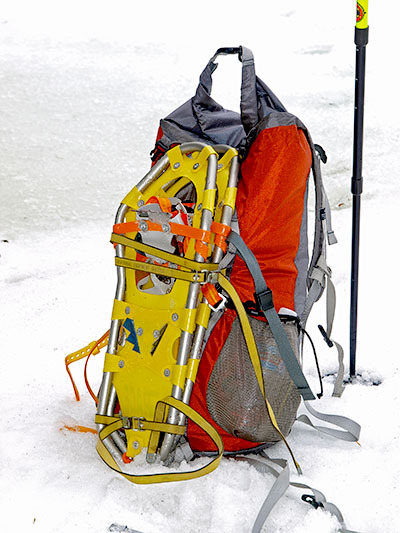 As a day pack, the Summit Sack is quite simple. It's also quite large, with a claimed 1,885 cubic inch (ci) (nearly 31 liters) capacity-easily double that of many day packs. With a roll-top closure, the Summit Sack also has padded shoulder straps and a simple, thin webbing waist belt. There's no sternum strap. Two mesh side pockets are fitted with toggled elastic closures to keep contents inside. One pocket has a little loop webbing loop at the opening, probably a key keeper. Back panel, showing shoulder straps and waist belt. Twin daisy chains and ice axe loops are on the back. 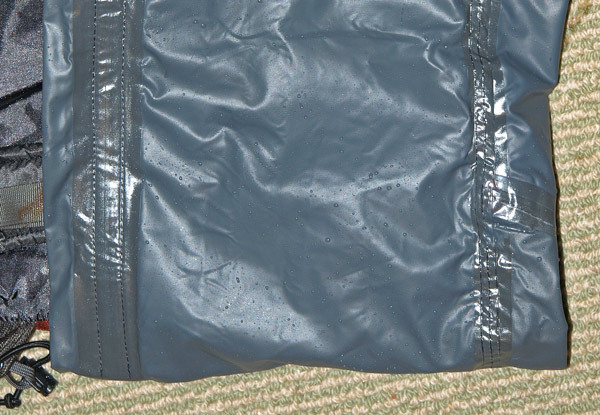 The main bag fabric is Hydroseal-coated Antron nylon and all seams are taped against leakage. There's no back panel padding or stiffening, meaning the Summit Sack is a true frameless rucksack. Note: the slender webbing waistbelt helps keep the pack from bouncing or sliding on the go, but it doesn't take any load off the shoulders. That's the pack mode. 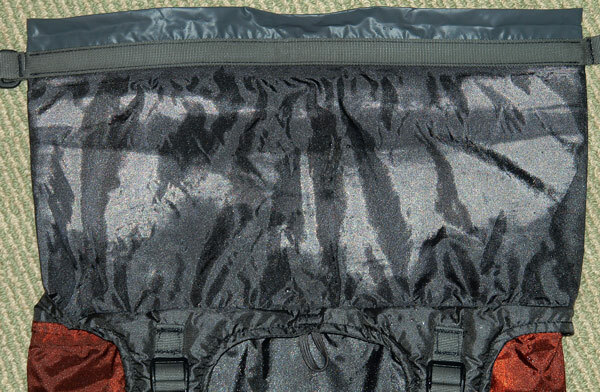 To convert to a compression stuffsack, the two waist belt halves buckle to the bag's top. They, along with the shoulder straps cinch in unison to compress the load. The roll-top can then be closed to fend off water, although Outdoor Research advises that the bag isn't intended for actual immersion. As a stuffsack the Summit Sack is huge, and would take up more than half of a lot of backpack's total capacity. 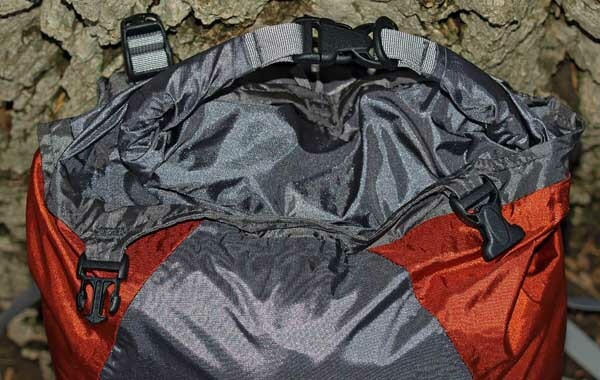 The Summit Sack is quite well made, with all fabrics, hardware and sewing appearing to be without flaw. Bar tacks are used at all points needing reinforcement. Seam taping is without notable gaps or missed seams-important for providing waterproofness. Overall feel and appearance are consistent with a high-quality product. * Loosen straps and stuff gear in sack. * Use your knees to compress contents. * Purge air pressure by pressing down on top closure. * Find the dark grey coated fabric at the opening. * Match the edges and fold them over the light grey nylon webbing. * Roll top three times and fasten buckle. That's a lot of instructions for a seemingly simple process, but the pointers about carefully mating the fabric opening are probably critical to establishing a seal. The question arises whether the three rolls are half or full rolls-it's full rolls. Roll-top provides closure as well as a handle. Other than perhaps correct use of the roll-top, Summit Sack operation is obvious and straightforward. The only adjustment is to unbuckle the front compression straps to that they can be used for the waist belt. The test bag is visually identical to the maker's description. It weighs slightly less (0.2oz/6g) than spec, and dimensions match theirs except for height. My height measurement is 22.5 inches rather than 24 (57 vs. 61cm). This could easily be explained by the roll-top, which can be closed in a variety of positions and bows outward with a large load. In a bag/pack this large, the discrepancy is of no importance. 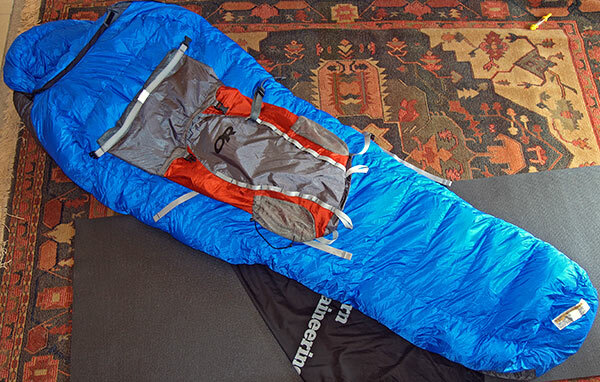 OR provides no maximum weight guideline for the Summit Sack. The main sack fabric, described as Hydroseal coated Antron nylon, is used by OR throughout their DryComp storage sack line. The fabric and coating appear robust to the eye and touch, but it isn't stiff and wrinkly like many similar fabrics. It's quite nice. Water initially beads up and rolls off, leaving the surface dry to the touch. Extended soaking wets out the fabric face, but water never penetrates the inner coating. The padded shoulder straps aren't covered by an open weave or fuzzy wicking-type fabric as used on many packs, but the shiny nylon fabric doesn't appear to be waterproof either, holding some promise it's not impervious to sweat. The padding seems to be closed-cell foam, as it doesn't become soggy with extended water exposure. Webbing compression and roll-top straps are three-quarter inch (19mm) wide and the daisy chains and axe loops are of half-inch (13mm) webbing. Shoulder straps are small, but padded. 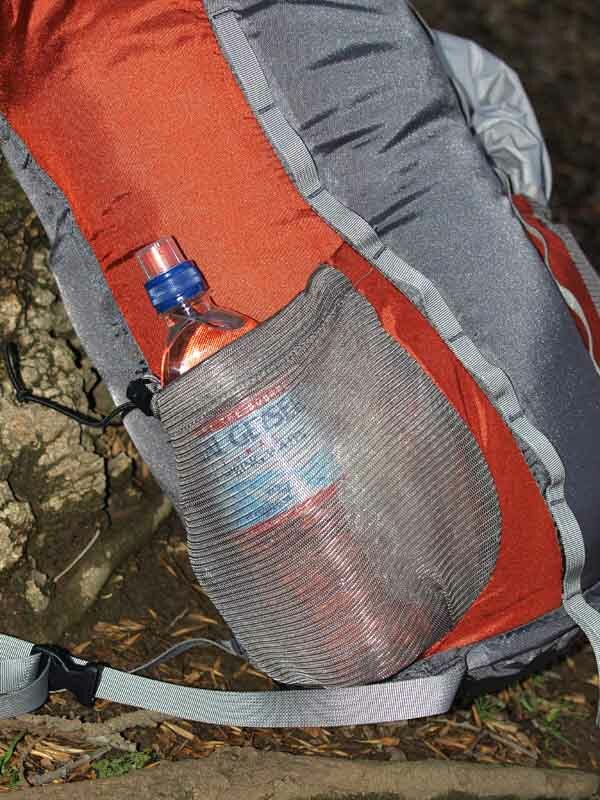 Roll-top design provides a robust seal against the elements, but the waterproof design doesn't allow for a drinking tube port through the main compartment (a common feature on typical packs). All is not lost because Outdoor Research has kindly provided two side pockets large enough to hold a water bottle each, with room for additional stuff to the side. The pockets' toggled elastic closures should keep contents safely inside, including water bottles taller than the pockets themselves. One pocket has a small loop on top, probably a key keeper anchor. Two ice axe loops with corresponding daisy chains accommodates toting two tools, provided the user adds a strap for each. 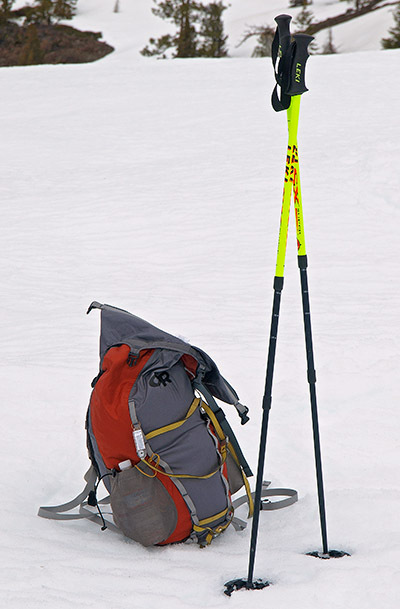 The Summit Sack is large in either role-stuffsack or day pack. As a stuffsack it swallows any of my sleeping bags; in fact, it easily takes a three-season down bag AND a summer-weight down bag with space left over for clothing. Big. As a day pack it easily accommodates considerable bulky winter clothing and gear, food and water. Truly, it carries far more than I want to carry in a pack with no frame or padded hip-belt. The pockets are equally generous. An 0.75L (25 fl oz) water bottle fits easily in either with just the top sticking out, and I can even cram a lightweight rain jacket into a pocket, easy to reach in a squall. Pockets are surprisingly large, and are secure. 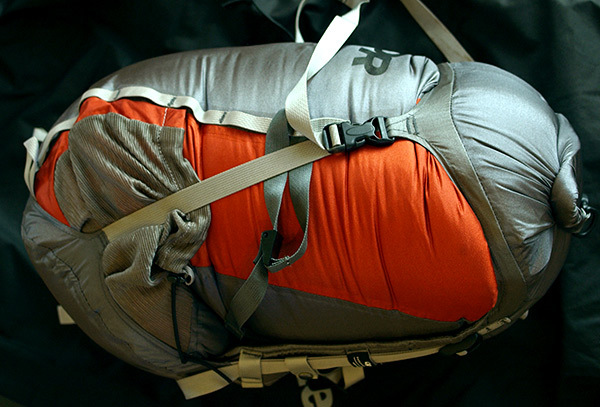 * How much stuff does the Summit Sack reasonably hold as a pack and as a stuffsack? * How well do the roll-top and compression features work? * How's the day pack's fit? Do the shoulder straps stay in place without a sternum strap? Is the waist belt comfortable despite being anchored at the bag's front? * What are the minimum and maximum day pack load volumes, and how much do the contents affect fit and load support? Can it accommodate lumpy, heavy things like cameras? Is there a way to reduce its volume to maintain load control? * How useful are the daisy chains and mesh side pockets? * Is the wispy haul loop adequate for hoisting a loaded pack? * Is the fabric sufficiently cut- and abrasion-resistant to maintain waterproofness? Anybody who treads through soggy countryside, or kayaks or canoes, appreciates the value of seam-sealed roll-top storage bags. It's comforting, and occasionally lifesaving, to keep your gear dry. 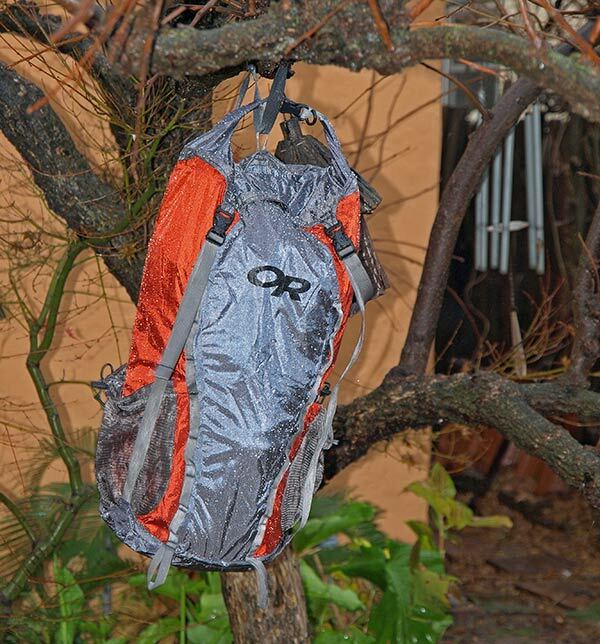 The DryComp Summit Sack appears ready to fend off all wet conditions short of a full dunking. 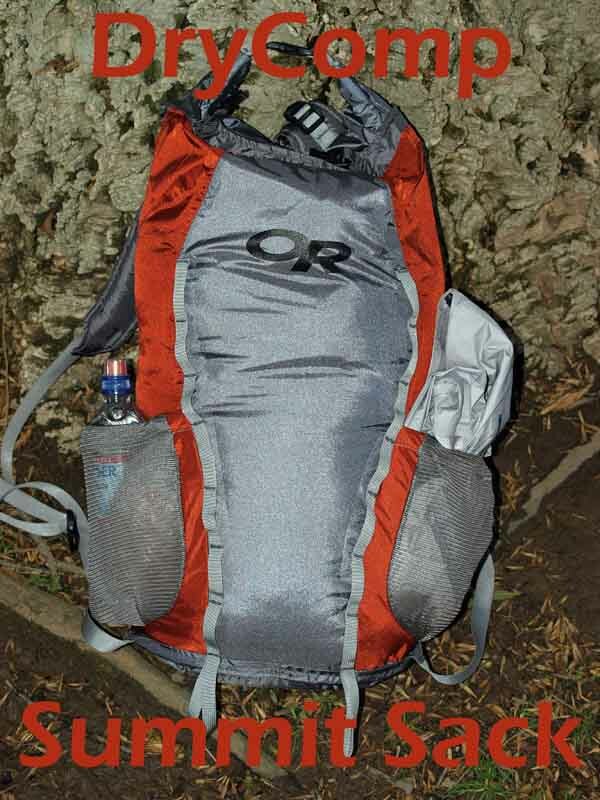 The additional capability of serving as a large day pack sets it apart from a simple dry bag. Designed and built with evident care, the Summit Sack should tempt anybody who ventures out from base camp and wants to carry gear and supplies. It also promises to be a simple, secure, large day pack for folks who wander in the rain-few packs are waterproof, requiring a pack cover or the use waterproof stuffsacks inside. As the name implies, there's no reason to doubt that the Summit Sack will support fast summit bids from basecamps in alpine settings everywhere. Is it right for you? That depends on whether you're willing to tote a few extra ounces over what a typical lightweight stuffsack weighs to capitalize on the Summit Sack's "bomber" protection as a stuffsack and double role as an auxiliary backpack for daytrips. Because it's so relatively simple, I find myself wanting to add stuff to the Summit Sack. But that would also necessarily add weight and in many cases, more seams to seal. Time will tell during this test whether anything proves an obvious omission, but for now I'd be interested in a sternum strap and a compression system, perhaps incorporating the daisy chains. We just experienced a huge storm with the strongest winds recorded since 1959. I wonder how the Summit Sack fared hung from a tree in the backyard? I took advantage of our wet, cold January with three day hikes in the region--two in the Delta region and one in the Sierra foothills, all in the rain. February brought three more day hikes, again two in the flats and one in the foothills, but only one was soggy. Day hike loads included season-appropriate clothing, snacks, water, the "10 essentials" and camera gear. I also used the Summit Sack for toting clothing and gear around, but not really what I'd call hiking. Items included kid clothing, valued stuffed animals, snacks, camera gear, etc. Due in part to the mysterious disappearance of my snowshoes, I didn't use the Summit Sack on an overnight. The number of total day hikes in the field report period was five. Trip lengths were two to six hours. All hikes were in above-freezing temperatures, ranging from the low 40s to mid 60s Fahrenheit (5-18C). Strong winds accompanied some of those trips. Fun stuff! Only the foothill hikes were, well, hilly. Valley hiking in the Delta region is pancake-flat except when exploring levee areas. What proved to be the strongest storm in half a century blew through the first week of January. I jumped on the opportunity to test the Summit Sack's waterproofness, as well as the strength of its stitching and strap anchoring. I stuffed it full of newspaper (hey, I'm not completely daft), locked down the roll closure and hung it in a backyard tree for a few hours. Even though the yard is protected by neighboring houses we got a good dose of the storm's full fury, enough to make the house leak in places we've never seen water before. Rain eventually soaked through the DWR (durable water-repellant) fabric treatment but never defeated the inner urethane coating or the seam taping (as far as I could tell). Score one for OR. However, the rolltop closure proved an Achilles' heel, as water worked its way past the fabric folds and wet the top paper stowed inside. Based on the moisture patterns, I believe the rolltop's webbing straps wick water inside, where it continues into the pack's interior. It wasn't a lot of water that made its way inside, but enough to dampen clothing or a sleeping bag. These weren't typical hiking conditions but perhaps evidence that the Summit Sack might not be a drybag substitute, such as for rafting. At least, if storing a sleeping bag and clothing at the bottom of a backpack in very wet conditions and a good deal of water enters the main pack and settles on the bottom, over time water may very well wick into the contents. I've experienced this very phenomenon with other stuffsacks, with the result of a soggy down bag (unsealed stuffsack seams contributed in those instances). Dark areas show water's tracks. Droplets show water's path inside. It may be that treating the rolltop webbing with waterproofing would prevent this wicking and enhance ultimate waterproofness. Tent makers sometimes recommend sealing their webbing anchor tabs to prevent water from wicking into the tent; a similar strategy might be wise with the Summit Sack. 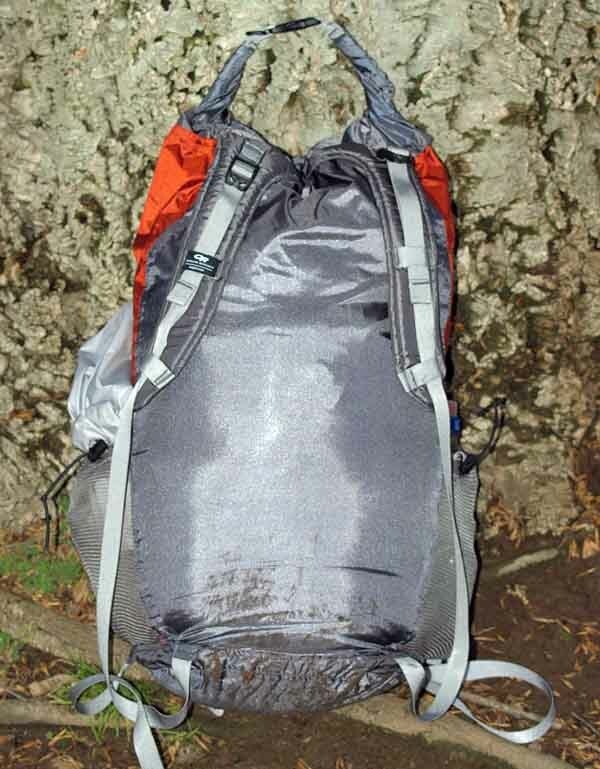 I must emphasize that at no time hiking in the rain with the Summit Sack did water penetrate the bag or closure. I've walked for hours in the rain and plopped it on soggy ground without any water making it inside (except while retrieving gear, of course). The fabric, rolltop and taped seams all worked perfectly. In fact, few surprises emerged when I hiked with the Summit Sack. For comfort and load control, it relies heavily on what's being carried and how it's packed, typical of a simple rucksack. Time and again on my trips with it, I find I'm not filling the pack to capacity unless packing bulky warm clothing. When less than full, it's important to pad hard items like cameras and other gear with clothing or even towels to keep the pieces from banging into one another or jabbing me in the back. 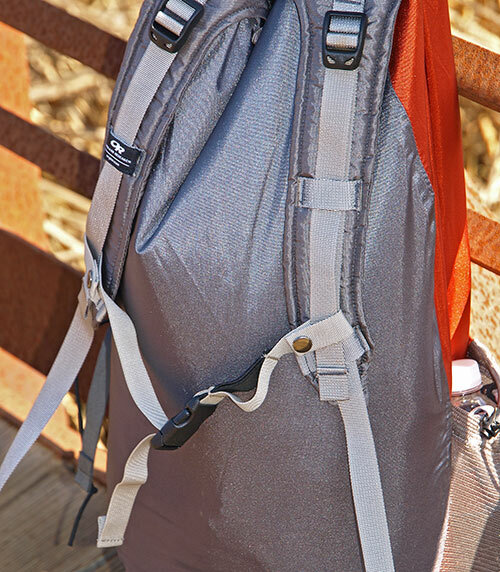 Note: the Summit Sack is no longer a compression sack when used as a backpack, as two of the compression straps combine to become the waist strap and the other two are loosened to become the shoulder straps. This means there's no load compression, other than that provided by the roll-top. Loads up to the 10-12 pound range (approx. 4.5-5.5 kg) are fine for long stretches, so long as the Summit Sack is packed well. Above that and I really notice the lack of a suspension or load-carrying hip belt. I've exceeded 20+ pounds (9-10 kg) and with those loads, there's no substitute for a suspension and hip belt. The shoulder straps work partway off my shoulders, especially with slick-shelled jackets. I've added a sternum strap snagged from another pack to prevent this and evidently OR agrees with me, as they now list one as a Summit Sack feature on their Web site--with whistle! The little waist belt does its job keeping the pack from bouncing off my back, but doesn't bear any load, of course. Added sternum strap adds comfort. With water, snacks and GPS stashed in the side pockets, there's little need to dig into the pack on the go, that is until I have to retrieve my camera or some clothing. It's easy to unbuckle and unroll the opening, but digging into the pack's deep, dark recesses can make finding a particular item a challenge. Pretty much every big, top-loading pack I've ever used shares this problem, except for those made from light-colored or translucent fabric. The slender daisychains and loops have proved fine for lashing and toting trekking poles and a camera monopod. I've not tried lashing anything heavy or bulky, such as snowshoes. 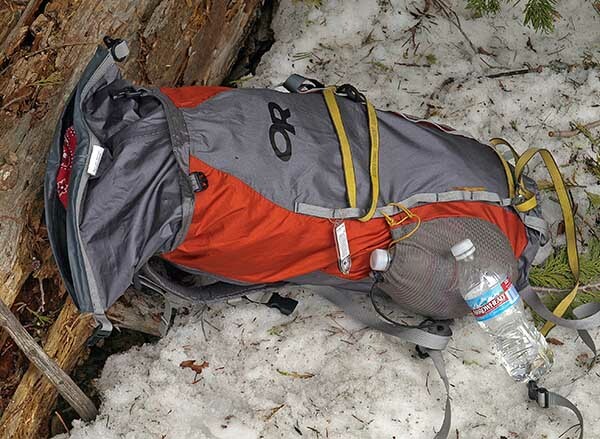 As a compression stuffsack, the Summit Sack does a pretty good job with a serious winter-weight down bag. The four compression straps aren't ideally located and the sack tends to bend towards one side, and trapped air makes achieving the absolute minimum bulk a goal not completely realized, but probably not too far off. Summit sack swallows winter superbag. The Summit Sack is a specialty piece of gear that deserves consideration by anybody who establishes a backcountry base camp and ventures out from there on day trips--be it peak-bagging, trout-stalking, photo-snagging, what have you. As a stuff sack it's bombproof in all but the most severe conditions, a safe haven for your sleeping bag and can't-get-wet clothing. As a day pack it holds an inordinate amount of gear, clothing, water and snacks and is likewise reassuringly weather-resistant, if not completely weatherproof. If there's a downside, it's ironically the Summit Sack's vast capacity. It's easily two-thirds of the size of my typical multiday backpack and as pointed out earlier, holds not one but two, three-season sleeping bags. Its excess capacity with respect to my typical basecamp day-tripping means partial loads, resulting in less than ideal comfort on the go. However, for wintertime or true expedition-style, large-load trips, the immense capacity and bombproof nature come to the fore. * I recommend anybody who has a Summit Sack without a sternum strap to add one. OR evidently has. * I recommend OR add a "burp" valve to ease the compression process. I'll continue to use the Summit Sack as a day pack, especially when I'm toting bulky clothes. I may yet use it in stuffsack mode on an overnight, depending on late winter/early spring in the Sierra and whether I ever find those snowshoes. 1. It allowed me to see how effectively it fended off moisture when plopped on the snow and in falling snow. 2. It provided an opportunity to test the carrying ability of the daisychains and axe loops. First trip conditions were cold and windy, with light to moderate snow, temperature from 28-30 F (-2 C) and wind gusting to 25 mph (40 kph). I was out about six hours and covered about 8 miles (13 km). The second trip was calm with intermittent clouds, and around 45 F (7 C), and I was out ten hours and covered 12 miles (19 km). Also, since summer's arrived too darn early here in the flatlands I've carried the Summit Sack around town a couple of times in the heat toting camera gear, spare clothes (padding for the gear) and water, totaling about 10 lb (4.5 kg) and half-filling the pack. Temps were in the high 80s and low 90s F (31-33 C) and when it's that warm, the pack quickly makes my back and shoulders hot and sweaty, enough that I prefer to sling it over one shoulder rather than use both shoulder straps. These trips were relatively short, ranging from two to four hours. I don't have good mileage estimates because they were more wandering than hiking, "stop-and-go" type trips. The Summit Sack proved impervious to falling snow and the snow already on the ground. The closed rolltop kept the falling, wind-driven snow out of the pack and when I plopped the pack in the snow while on breaks, it never soaked through the fabric or the seams. The slick fabric also sheds snow quite readily. My conclusion is that this simple pack is great for fending off wintery conditions. In addition, its large capacity carries as much winter clothing as I care to pack. Bulky down jackets, fiberfill pants, full-length softshell parkas all disappear. None of it's organized of course in the single compartment, but lightweight stuffsacks help here a good deal. Coincidentally, bulky winter clothing give the Summit Sack shape and stability that it lacks when half-filled, for a better fit and load control. I strapped lightweight snowshoes and poles to the Summit Sack using a pair of buckled straps (not supplied) through the daisy chains. This scheme worked out fine, without upsetting the pack's balance. I note that the snowshoes I used are small and light compared to my terminally missing older ones at a mere 2 pounds (0.9 kg) for the pair, half the heft of typical backcountry snowshoes. Total starting load was a bit over 20 pounds (nearly 10 kg). On the flats, uphill, downhill and through tangled stands of trees, the Summit Sack proved a decent snow country daypack. In fact, I have to tip my preference for this very use, as the pack's size, simplicity and waterproofness seem best suited for winter conditions and bulky clothing loads. I can carry adequate water and snacks in the outside pockets and there's little sweatiness from the non-ventilated back. At this test's conclusion the Summit Sack looks nearly new. The shoulder straps show some creasing but that's about it. There are no fabric wear marks or snags, the buckles work as new and the stitching and taping are completely intact. Dirt and grime wash off easily in the sink or under a garden hose. Contents completely safe from snowy intrusion. The Summit Sack is clever and well made. It's waterproof in all but extreme conditions and it holds whopping gobs of gear. It's reasonably comfortable as a daypack, considering its simplicity and dual-use role, but it will never be mistaken for a purpose-built fitted pack. I tested, but never fielded the Summit Sack as a stuffsack because it was far larger than any stuffsack I needed during the test period. First, due to a considerable time-lag between the application and the delivery, I missed last year's summer-fall main hiking season, when I take longer trips that include hikes and climbs from basecamp. Second, even compressed the Summit Sack takes up well over half the main compartment capacity of my typical multi-day backpacks (which range from 45 to 55 liters/2,500 to 3,400 ci). This is the main reason I'd love to see OR release a smaller version of the Summit Sack. Countering this disappointment, I did find the Summit Sack makes a great suitcase substitute for travel. It's sort of a wearable duffel bag that at my destination, gives me hiking and everyday carry capability. --Shrink capacity by a third. --Lengthen the padded portion of the shoulder straps. But do keep the excellent fabric, seam-taping, rolltop closure, external pockets and daisychains. I'll continue using the Summit Sack when I need a day pack with lots of capacity, such as my snowshoeing trips during this test, and for general travel. 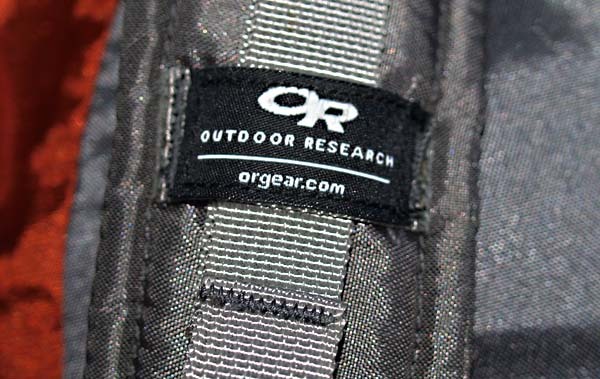 Hearty thanks to Outdoor Research and Backpack GearTest for the opportunity to participate in this test. This report was created with the BackpackGearTest.org Report Writer Version 1. Copyright 2008. All rights reserved.